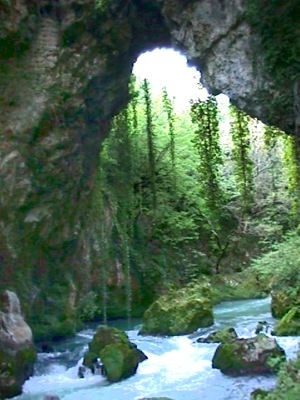 After the village of Zitsa, close to the village of Lithino, Kalamas river made a miraculous place. It sculped with its wild water the rock and created the natral made bridge of “Theogefyro” which for centuries made easy the passage of the river for the people. The crossing of the river was not allowed anywhere else becaus of its water. This bridge was inspired Chrysanthi Zitsaia, who in 1956 wrote and publish the book “The legend of Theogefyro”.